Fool’s Mate (also known as the 2-move checkmate) is the quickest possible checkmate in chess. It should not to be confused with the 4-Move Checkmate. Diagram above: The Fool’s Mate is reached after the moves 1.f3 (or f4) e5 2.g4?? 2.Qh4# The white king can’t move to a safe square and he can’t block the check either. It is unusual for white to move the f-pawn and g-pawn on their first two moves, but it is still a fairly common occurrence among beginners. Even if the Fool’s Mate might never happen in your own games (though it probably will at some point), it is still useful to know the pattern. This is because the basic pattern in the fool’s mate can be used in other situations too. The next example will demonstrate the point. Diagram above: Black just played g7-g5, threatening to capture the white bishop on f4. Why was this move a mistake? 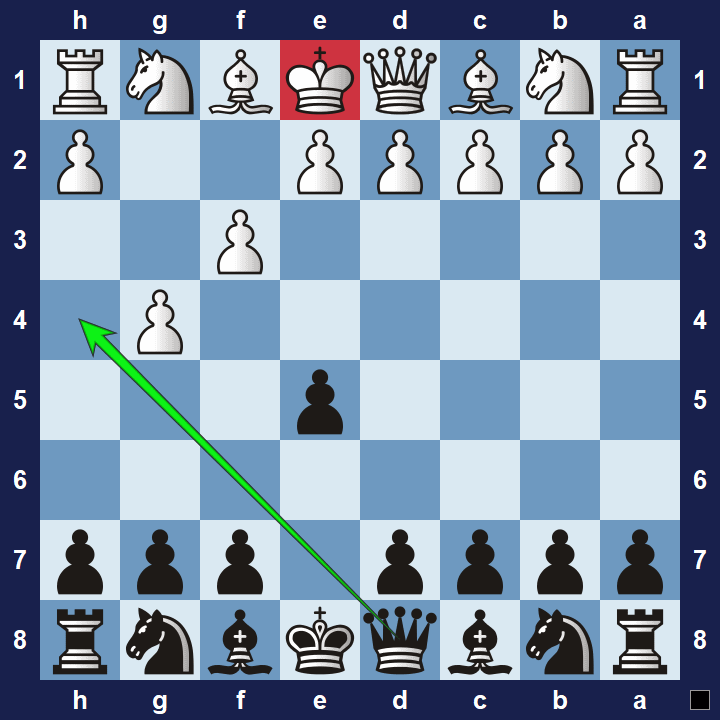 Diagram above: 1.Bh5+ Nxh5 2.Qxh5# uses the fool’s mate pattern to checkmate the black king. The wikipedia entry on the fool’s mate includes two actual games that concluded in similar manner. The Fool’s Mate is all about the weakness that is created as a result of advancing the f2-pawn (as white) or the f7-pawn (as black) early in the game. Note that in both the first and second example of the Fool’s Mate, the checkmated king was exposed by the “missing” f-pawn. This is an important idea to remember–the king is vulnerable if the f-pawn moves in the opening stage of the game. Diagram above: The pawn advance, f2-f3 (or f2-f4), means the white king can be vulnerable on the e1-h4 diagonal. This exposure can also be exploited by various other tactical ideas, which usually involves a queen checking the king on the exposed diagonal. Therefore it is generally not a good idea to advance your f-pawn early on in the game, or if you do–you should be aware of the potential dangers.